His real name was James Corbit Morris but everybody called him Jimmy Driftwood. 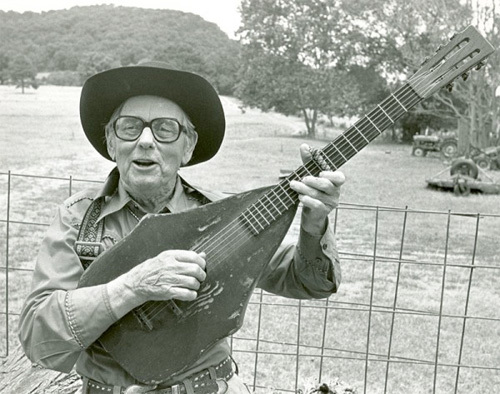 Born in 1907 in Timbo, Arkansas, he became a prolific songwriter and singer of American folks songs. During the folk boom of the 1960s Jimmy was in the “big time” having hits with songs he had written like “The Tennessee Stud” and the “Battle of New Orleans.” Jimmy wrote most of his songs to get his rural Arkansas high school students interested in history. He had no idea at the time that they would become country classics. He once told me he had written 3,000 songs. I found that hard to believe so he showed me a shelf in his music room filled with 3 ring binders. The shelf must have been ten feet long. Each binder was filled with words to songs. He said, “Pick one and I’ll sing it for you.” There were no tune notations in the binders, just words. I chose several that I had never heard of and he launched into each them with full force…like he had sung them yesterday. Jimmy also popularized the mouth bow and played the guitar in this picture which was made from the headboard of his grandfather’s bed. It sounded funky but it has soul that wouldn’t quit…and so did Jimmy.